Because of its place at the forefront of key events at the outbreak of the Civil War, the three-month service of the Sixth Regiment inspired artists, scores of songs and poems, and an avid following during the beginning of the war. The regiment became known as the historic “Old Sixth.” Citizens in New Jersey, New York, and Baltimore presented the regiment with colors and national flags in tribute. The House of Representatives sent thanks “for the alacrity with which they responded to the call of the President, and the patriotism and bravery which they displayed on the 19th of April last, in fighting their way through the city of Baltimore, on their march to the defence of the Federal Capital.” Reporters were sent to the field to follow it. Its dead were returned to Massachusetts, met by Governor Andrew and his staff, and bestowed military honors in grand ceremonies, with large granite markers erected in their honor. The emotional and libertarian symbolism of the first deaths of the Civil War, happening on the anniversary of the opening battles of the Revolutionary War, fueled the fervor. But as the war dragged on, with huge battles and losses on both sides, the significance of the Sixth Regiment’s service was overwhelmed by events of the day. In 1911 Brevet Brigadier General Jones, who had been promoted from colonel in 1866 for his meritorious service during the war, asked, “Have you ever given a moment’s thought to the change in the situation had not the Sixth Massachusetts Regiment reached Washington on the evening of the 19th of April, 1861?” With Washington under siege and the momentum in the Confederates’ favor during those early days, even President Lincoln had expressed his certainty that the fall of the Union was near. 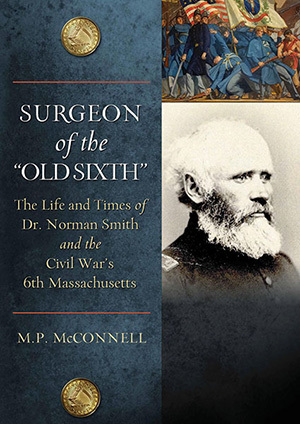 As Brigadier General Jones recalled, the president thanked him upon the regiment’s arrival in Washington, saying if the regiment had not arrived that night, “we should have been in the hands of the rebels before morning.” Brigadier General Jones, firm in his conviction, exclaimed, “The historians of the great civil war have not accorded to the Sixth Massachusetts Regiment the credit to which it is entitled,” adding, “the success of the march saved the capital. . . . That it preserved the Union is equally true." Photos: Top - Dr. Smith letter to his wife, Mary Jane, from Baltimore, May 15, 1861. Courtesy Arbittier Museum of Medical History, York, PA; Bottom - Colonel Edward F. Jones, Sixth Regiment Massachusetts Volunteer Militia. Boston Globe, April 17, 1911.